Long laborious months of planning and theorizing are yesterday’s launch model. Speed is of the essence in our fast-paced business world. This is especially true when getting a new marketing team or initiative off the ground. You need to get it up and running in 90 days—and do it well. This can be a tall order for leaders who are new to the world of digital promotion. Marketing today is a technical and complex shifting target. It also offers meteoric potential when done right. The same swift evolution that creates a massive learning curve—new distribution models, multiplying digital platforms and channels—creates an opportunity to outshine competitors and capture customer attention in a lasting way. As long as you tackle that aforementioned learning curve, that is. Partnering smart and creative campaigns with technical proficiency is no minor feat. Luckily, smart marketers don’t need to reinvent the wheel. Instead, they can hit that 90-day mark like a marketing supernova—by bringing in an expert who can leapfrog over the usual obstacles, implement best practices for technology, and create an outstanding content program. Take the case of a client of mine. A marketing director who cut her teeth on old-school practices and print campaigns, she found herself tasked with launching a new digital program at hyperspeed. It had to be incredible, and it had to be fast. Her first instinct was to develop a crackerjack in-house team—but her instinct was dead wrong for several reasons. My client knew she needed an actual team; she was experienced enough to know that the marketing unicorn who does it all is a myth. But she wasn’t quite prepared for what kind of team she would need to build, or the time, effort, and money it would require. She quickly discovered she needed someone with strong funnel expertise, a multimedia graphic designer who could create polished visuals, and a writer who could craft appealing content that aligned with the brand story. Powering their efforts would be an analyst to turn data into insight and identify potential revenue. Then there was the technology. My client needed someone who understood CRM systems, marketing automation platforms, and other tools. Not only would these platforms deliver the data needed for customer insight and targeted campaigns, but they could produce the solid performance analytics she needed to win budget from her C-suite leaders. The estimated cost of finding, hiring, and managing all of that skill and expertise in-house stunned her. And of course, even the sharpest talent would have to learn to work synergistically, which would eat up more time she didn’t have. At this point, she hit upon the perfect shortcut: bringing in an outside provider. By working with a consultancy that could bring marketing talent, experience, and technical skill to the table overnight, she was able to jump right over delays and produce a powerful digital marketing program, on time and on budget. Bring you up to speed on best practices. These can change from year to year. They can make a quantitative difference in your productivity, as well as a qualitative difference in your marketing department culture and the caliber of your work. Offer the right creative talent. Misguided marketers sometimes think they can tap an internal staff member to learn a design program or write the copy or brush up on their coding skills. This frequently leads to subpar campaigns, which leads to subpar ROI. Consider experienced outside talent who can create high-impact campaigns that drive strong results. Contribute technical expertise. Please note I didn’t say “familiarity.” Lots of people have dealt with CRM systems or marketing automation, but it doesn’t mean they understand how to maximize the tool’s potential or develop intelligent strategies for all of the features. 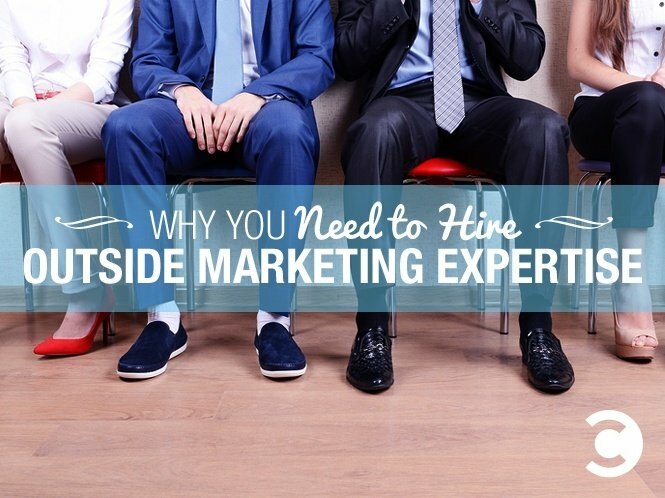 Whether your outside expert trains your team or handles the tech themselves, make sure you’re working with a bona fide master of the platform. Once you’re working with your external provider, you’ll do your part by educating them on the basics. Let them know who you sell to, who kicks tires, who needs to be nurtured, and who’s low-hanging fruit. Prioritize the content assets you need, then let them work their magic. There will be time for nuances and fine-tuning later. You’ll drive more return by starting sooner with the basics rather than fiddling around with details for months on end. Follow this plan, and you’ll have a powerful marketing ecosystem up and running in 90 days—one that reaches the right customers, closes deals, and drives your brand into a future of impressive returns.